Take a walk on Niagara's wild side! Just as summer visitors flock to one of the world's most awe-inspiring natural wonders, a new book hits the shelves that looks at Niagara Falls from a unique vantage point. 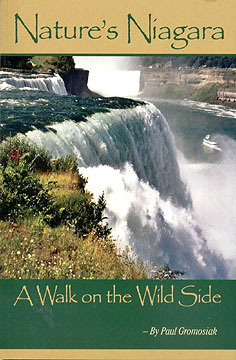 Nature's Niagara: A Walk on the Wild Side casts a spotlight on the natural history of Niagara Falls, including its fascinating geology, wild animals, plants and unusual phenomena. Authored by prominent local historian Paul Gromosiak, Nature's Niagara is crammed with riveting facts and true tales that are sure to intrigue readers. They will learn why the falls have moved seven miles since the last ice age and what causes the weird foam below Niagara Falls. Readers will learn about a dog that was cruelly tossed into the raging waters, only to survive the plunge and take refuge on a nearby island, shunning all humans after the trauma. Dozens of photographs - many of them in full-color - as well as user-friendly maps and charts make this book an invaluable guide for anyone who desires to better understand Niagara's power and majesty.